London, Mar. 25: At least 15 young Tibetan monks, three of them in their teens, who sparked a rebellion against China's repression, are said to be missing in their homeland. According to The Independent, the group handed out leaflets, chanted pro-independence slogans and carried the banned Tibetan flag during a peaceful march down Barkhor Street in the old quarters of Lhasa on March 10. Their demand was that the Chinese government that has ruled Tibet since 1951 should ease a "patriotic re-education" campaign which forced them to denounce the Dalai Lama and subjected them to government propaganda. The reaction of the authorities, desperate to snuff out the most serious uprising against Chinese rule for almost half a century, was rapid and brutal. 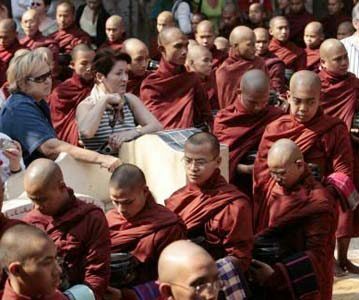 The group was detained on the spot, with eyewitnesses reporting that several of the monks suffered severe beatings as they were arrested and taken away. They have not been seen since. On Monday, Amnesty International called for their immediate release, along with all the other anti-Chinese demonstrators picked up in the past three weeks. The human rights organisation claimed they were at "high risk of torture and other ill treatment" and called on supporters to write to Chinese President Hu Jintao, and send copies to the Chinese embassy in London. Steve Ballinger, a UK spokesman for Amnesty, said: "China's reaction to peaceful protests in Tibet and neighbouring provinces – detaining demonstrators, flooding the area with troops and reportedly using violence – does not bode well for the Olympics. Some protests may have turned violent and the Chinese authorities have a responsibility to protect the lives and property of people in the region."